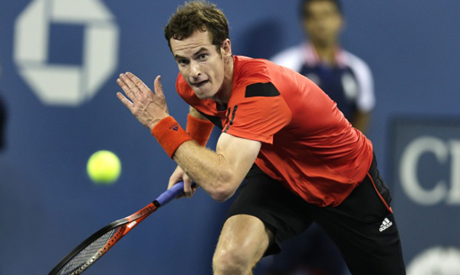 Defending champion Andy Murray put on a late night display at the US Open to cruise through to the second round after rain postponed play, while two-time winner Venus Williams suffered defeat. Third-seeded Murray, who snapped Britain's 76-year wait for a men's Grand Slam champion when he triumphed in New York last year, needed just 98 minutes to get past 33-year-old Frenchman Michael Llodra, 6-2, 6-4, 6-3. But his match only got underway at 9:55 p.m. (0155GMT) -- the third-latest start for a US Open night session -- after a four-hour rain suspension earlier in the day. That delay was compounded when 2009 champion Juan Martin del Potro and Guillermo Garcia-Lopez battled out a four-hour, 13-minute dogfight on the same Arthur Ashe Stadium, which the Argentine sixth seed won 6-7 (5/7), 6-4, 7-6 (9/7). "I think playing at that time for your first round is not ideal," said Murray, who hit 34 winners against just five unforced errors to book a match with Argentina's Leonardo Mayer for a place in the last 32. "It's not whether it's me, it's anyone. Just because I won last year, it's nothing to do with that. It's just more for the guys that have to play this evening, and you have guys that have two days off between matches." Amongst Murray's leading rivals for the title, Rafael Nadal completed his first round match on Monday, 48 hours earlier, while top seed Novak Djokovic and five-time winner Roger Federer both wrapped up their openers on Tuesday. Del Potro and Garcia-Lopez had provided the earlier spice for the Murray headliner when they exchanged angry words over the number of injury timeouts that the Spaniard was taking. "I just asked about the medical timeout because I didn't know how many or how long. He explained to me then the chair umpire also, and that's it," said Del Potro diplomatically. Del Potro, beaten by Djokovic in the longest Wimbledon semi-final of all time last month, goes on to face 2001 champion Lleyton Hewitt, who saw off Brian Baker 6-3, 4-6, 6-3, 6-4. Williams, the US Open champion in 2000 and 2001 and a seven-time Grand Slam singles title winner, went down in a three-hour, second-round clash to tenacious Chinese player Zheng Jie. Two-time major semi-finalist Zheng advanced to a third round clash against Spain's Carla Suarez Navarro by outlasting the American 6-3, 2-6, 7-6 (7/5) in a victory she called "unbelievable." At three hours and two minutes, it was the joint fifth-longest women's singles match in US Open history. "I didn't realize the clock was at three hours until the end. I was like, Wow, this is a marathon," said 33-year-old Williams. As a result of Wednesday's downpours, organizers postponed eight women's second-round singles matches and 20 doubles matches until Thursday. One of those held over was the second-round clash between reigning women's champion Serena Williams, chasing a fifth US Open title, and Galina Voskoboeva of Kazakhstan. The rain meant that some matches that started at 11 a.m. were being completed as darkness fell with Indian qualifier Somdev Devvarman defeating Lukas Lacko of Slovakia, 4-6, 6-1, 6-2, 4-6, 6-4 in a tie spread out over eight hours. Agnieszka Radwanska and Li Na managed to beat the rain to reach the third round. Third-seeded Radwanska defeated Spanish world number 103 Maria-Teresa Torro-Flor, 6-0, 7-5 while Li, the Chinese fifth seed, beat 100th-ranked Swede Sofia Arvidsson 6-2, 6-2. Radwanska, who has never got beyond the fourth round, next plays Russia's Anastasia Pavlyuchenkova. Li, playing in her 30th Grand Slam and a New York quarter-finalist in 2009, will next face 30th seed Laura Robson in a rematch of their clash 12 months ago, which the British player won. Robson defeated France's Caroline Garcia 6-4, 7-6 (7/5) to book her third round slot. Amongst men's seeds heading for the exit were Italian 16th seed Fabio Fognini, who lost 6-1, 6-2, 6-2 to Rajeev Ram of the United States. Jurgen Melzer, the 29th-seeded Austrian, who captured the Winston-Salem title at the weekend, slumped 7-5, 6-3, 7-6 (7/3) to Russia's Evgeny Donskoy while Alex Bogomolov of Russia sent French 24th seed Benoit Paire packing with a 7-5, 2-6, 6-4, 5-7, 7-6 (7/5) win. Croatian qualifier Ivo Karlovic placed America's James Blake into retirement with a 6-7 (2/7), 3-6, 6-4, 7-6 (7/2), 7-6 (7/2) win.